Check the fluid level in the reservoir periodically. The fluid level should be between MAX and MIN indicators on the side of the reservoir. Before removing the reservoir cap and adding brake fluid, clean the area around the reservoir cap thoroughly to prevent brake/clutch fluid contamination. If the level is low, add fluid to the MAX level. The level will fall with accumulated mileage. This is a normal condition associated with the wear of the brake/clutch linings. If the fluid level becomes low frequently, have the brake/clutch system checked by an authorized Kia dealer or another competent repair center. Use only the specified brake/clutch fluid. (Refer to “Recommended Lubricants’’ later in this section.) Never mix different types of fluid. 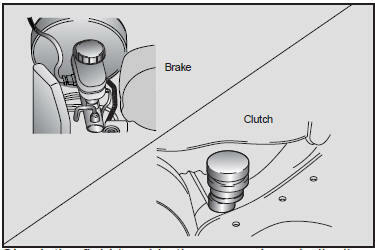 In the event the brake/clutch system requires frequent additions of fluid, the vehicle should be inspected by an authorized Kia dealer or another competent repair center.